The Jurisdiction Edition – Designed specifically with the State Boards in mind, this report provides a broad view of CPA exam trends from around the world. The University Edition – Focusing on university and accreditation reports, including international, regional, national and state. University rankings are also a prominent feature of this edition. These statistics, available only from NASBA, give you the best indication of the market today AND tomorrow. 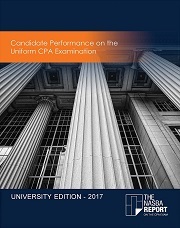 This report goes beyond the data available in the candidate performance books by offering a comprehensive view of how the students from your school are performing on the Uniform CPA Examination over a four-year period (2014-2017).